Bathroom walls are different from walls in other parts of the home. In living rooms, bedrooms, hallways, and other completely dry areas, any type of wall covering will work. Even kitchens, which are mostly dry, can have almost any type of wall covering. Backsplashes protect key areas in kitchens to make this possible. But in bathrooms, water comes from all directions. Moisture, both from direct tub and shower overspray as well as moisture-laden air, is devastating for bathroom walls. Bathroom vent fans do help, but even well-vented bathrooms can have moisture issues. Vinyl-coated wallpaper is one of the better options for bathroom walls in terms of functionality (all-paper coverings will degrade in the moist environment). But if 100-percent vinyl wallpaper makes you think of a hotel, think again. Vinyl wallpaper has grown up and become sophisticated. Retailers like Tempaper and Timothy Sue offer gorgeous vinyl wallpapers that have graced homes featured in style and shelter magazines. Just be sure that your present wall surface can accept peelable vinyl wallpaper. Because it is less sticky than permanent wallpaper, peelable vinyl wallpaper will not stick to matte, flat, or rough surfaces. Also, vinyl wallpaper works best for indirect, ambient moisture. So use in conjunction with a surface that covers the lower section of the walls. One benefit of vinyl wallpaper is that you can actually try it out before applying it. Buy a roll or a sample, then stick it up in the room. Large patterns will visually reduce the size of your bathroom. Verticals draw your eye upward and make the room feel taller. Horizontals seem to widen it. Bathroom paint is regular interior paint that has properties that make it better suited for bathrooms. With regular interior paint, the main thing to avoid is getting a flat or matte surface paint because the paint's pores trap water. A classic way to avoid this is to use semi-gloss or even a high gloss sheen; water beads up on these surfaces. But premium paints with mold-killing additives let you have those desirable flatter sheens in the bathroom. The best thing about using paint for your bathroom walls is cost. Eggshell or semi-gloss interior paint is inexpensive. Even designated bathroom paint, which can cost up to twice the amount of regular acrylic-latex interior paint, is far cheaper than using wallpaper, tile, or other hard surfaces. 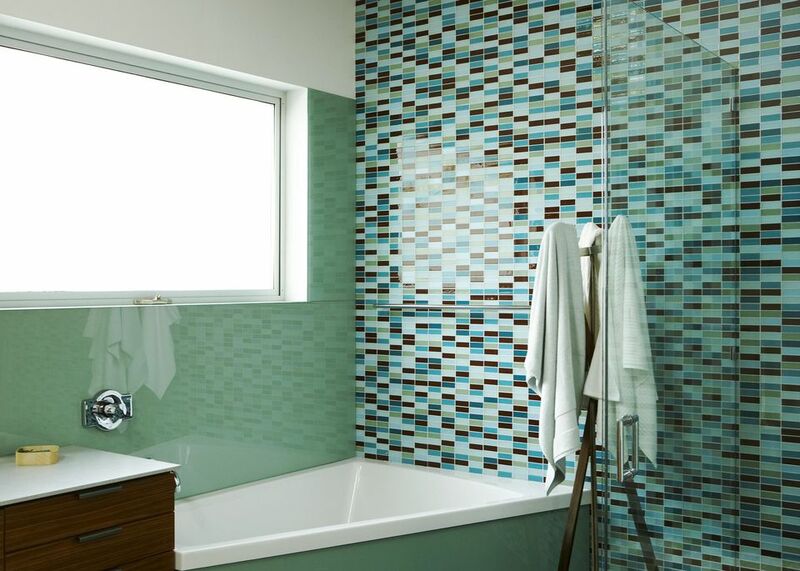 Ceramic tile is a classic choice for bathroom walls. With tile, as long as it is properly applied, moisture will never be a problem. Since the days of the ancient Romans, tile has been used even for standing-water surfaces such as the insides of bathtubs and pools. Design is your main consideration. All tile has grout. Grout means lines. Lines create patterns which can either enhance or detract from the bathroom's appearance. Too much tile can make a room feel busy, ponderous, sterile, and even depressing. Partially tiling the wall is a good compromise. Ceramic tile used as wainscot usually stops at a certain point on the wall, around 36 inches to 38 inches. Beadboard provides only partial coverage for the wall, the lower half. But the lower section is the most important part when it comes to moisture problems. Beadboard can be painted with semi-gloss or glossy paint, which thoroughly protects the lower parts of the walls against moisture. For easier installation, purchase panels of beadboard that are 8 feet long by 4 feet high. Installed lengthwise, these long boards lay down quickly with construction glue and finish nails. For a more refined and historically accurate look, choose individual beadboard planks. Beadboard gives your bathroom a classic look, which can be either an asset or a deficit. For traditionally styled bathrooms, beadboard fits right in. For modern bathrooms, beadboard is out of place and ungainly. At first glance, tileboard looks like ceramic tile. Tileboard comes in large format panels that let you install 32 square feet of wall covering that looks nominally like tile in just a few minutes. Better tileboard looks closer to real ceramic tile and the wear surface is coated, so it repels moisture. Cheap and easy to install, tileboard is best used for a guest bathroom or basement bathroom due to its economical appearance. Tileboard is a bargain material that fixes wall problems quickly but adds little long-term value to your home. One downside to tileboard is that it rapidly swells up and will not recover its original dimensions if water reaches the back of it. One way to avoid this problem is to keep all seams and edges caulked with bathroom-grade silicone caulk.